After graduating from high school, my dad taught several years at the Springfield country school in Roloff Township, near Kulm, North Dakota. Some family stories can be proven. Some can’t. But sometimes those stories leave a trail of clues. My dad was the first of his siblings to go to high school, although he was the sixth born of 10 children. 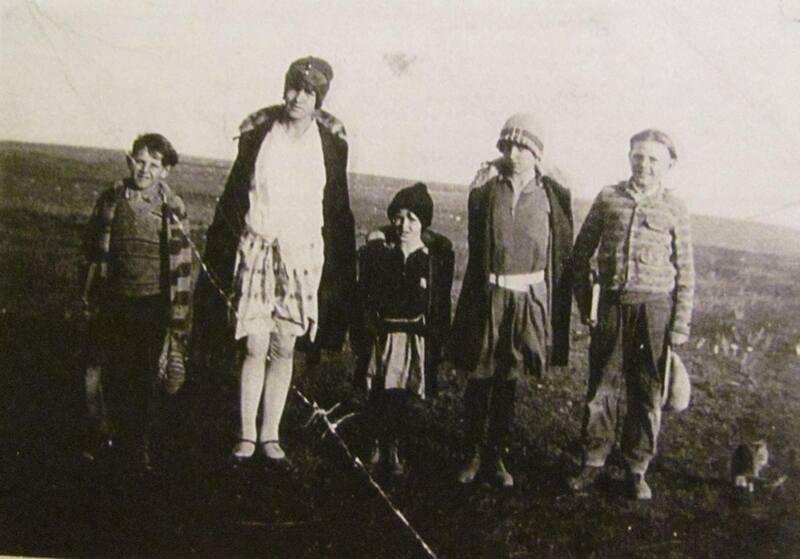 In a farming family during the Depression, high school was unnecessary and a poor substitute for hard work. Or at least, that’s what my Grandpa Peter thought. 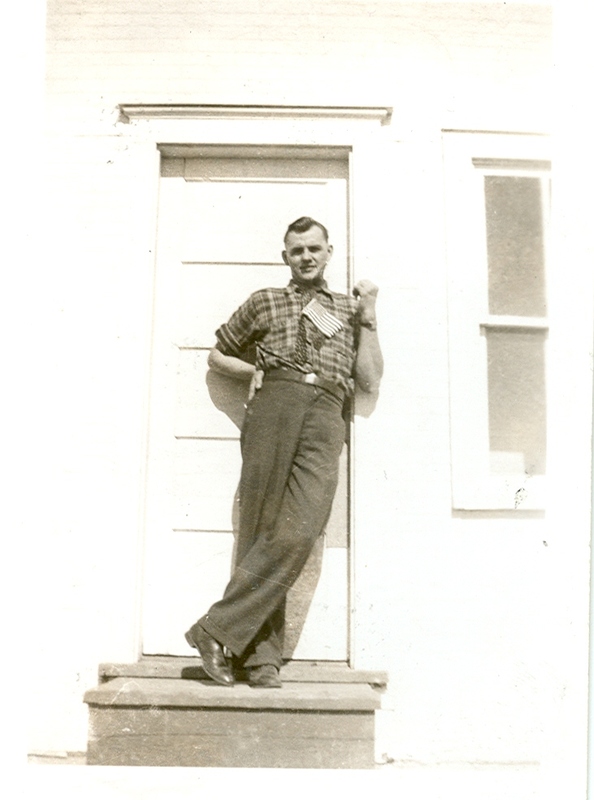 My grandfather thought his solid German work ethic was the example his children should follow. He’d never gone to high school; why should he spend money to send his son? But my dad, Harry, had developed a burning desire to get an education. He wanted to get off the farm and never again wear overalls or “pick” rocks to clear the fields for planting, a seemingly never-ending task for farmers in southeastern North Dakota. Although there was financial assistance available for low-income high school students, my dad didn’t qualify because my grandfather’s income was too high. The family story is that young Harry came up with the audacious plan of writing to the governor of North Dakota, explaining the situation and asking that an exception be made. Not wanting anyone to know what he was doing (whether from fear of failure or because he didn’t want it known he was going against his dad’s wishes), my dad snuck to the train station and popped the letter in the mail just as the train was leaving town. My mom explained to me with pride that the governor granted the exception and gave my dad the financial assistance he needed to attend high school in the nearby town of Kulm. 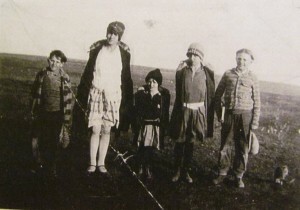 My dad (far right, age 10) heads to the country school with his brother and sisters. I have no idea if the story about the letter to the governor is true, and can’t find hard evidence to prove or disprove it. But there are lots of clues that make this story plausible. My dad did graduate from high school (Kulm High School Class of 1938), the first in his family. He went on to a business college in Minneapolis, got off the farm, and spent much of his career in banking. My uncle confirms my grandfather’s aversion to higher education and remembers my dad being the inspiration for his younger siblings to graduate from high school and go on to business school. My dad’s cousins remember that he boarded with them in town during the winter so he could attend school without trudging four miles through the deep Dakota winter snows. They remember my grandmother occasionally sending a chicken along with him to help pay his board. I remember my dad’s commitment to my education (my low-key, ever-tolerant dad came unglued one time I casually offered the opinion that college might not be that important). 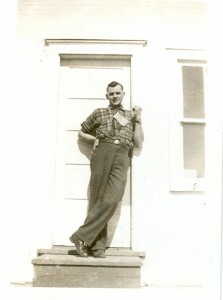 His fierce desire to leave the farm behind was expressed in his forbidding me ever to wear overalls (though I was forbidden little else; he merely raised an eyebrow when I showed up at the dinner table with violent blue eye shadow at a too-young age). 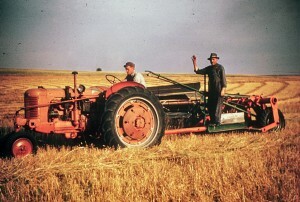 Grandpa Peter farming his land, probably in the 1950s. My grandfather’s farming success seems to indicate that he was savvy in both agriculture and business, so I never understood why he wouldn’t see education as a good investment. And then I found a book about my grandfather’s home village of Hoffnungstal (“Valley of Hope” in German), Bessarabia, Ukraine, that described the prevailing feeling there about education. All the clues fell into place for me. My grandfather grew up with the notion that education was useless and the only way to get ahead was to farm more land. He thought his son’s idea of going to high school was a waste of time that would hurt his ability to make a good future for himself. Although I’ll never know for sure if the story about the letter to the governor is true, I often wonder if my grandfather ever recognized that his son, my dad, had inherited his ambition to succeed even though he had a different idea of how to get there. [i] Declaration of Intent. State of North Dakota, Logan County. February 2, 1920. [ii] Kulm, North Dakota 1892-1957. Published for the town’s anniversary. Pg. 88. [iii] Hoffnungstal, Gnadenheim, Philippowka von der Gründung bis zur Umsiedlung 1940. Peter Krug Verlag, Bietigheim, Germany, 1983. Pg. 29-30. Translation by Carolyn Schott. I believe that there can be a hint of truth to this. Stores handed down can be jived up, but back then the desire to succeed was strong and so was the desire. As you say, they are hints. Not sure, would have to look it up this early a.m., but I think my Great Grandmother was born in Hoffnungstal . Now you have me very curious about my family member. Thanks. Marilyn – curiosity is good! Let me know if you have Hoffnungstal roots!